Should You Start Dyeing Your Armpit Hair? A new grooming trend is making news. 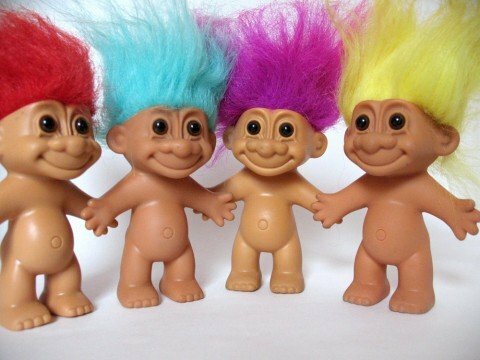 In addition to news about the Iran nuclear deal and the Greek economic crisis, readers of The New York Times awoke this morning to a curious story about a supposed new grooming trend: women who dye their armpit hair in a rainbow of hues not seen since those Troll dolls were in vogue. It’s like a Speedstick truck collided with a Skittles display during an Orange Is the New Black viewing marathon. Even Marilyn Manson at his most out-there never went this far: we’re talking neon blue, pink, violet, and green. There are YouTube tutorials for the uninitiated, as well as blogs and hashtags devoted to the trend, and at least one salon will even do the work for you, although the service is pricey at $65 (not including a tip, which the colorist definitely will earn). Bennett and the Sisterhood of the Technicolor Pits are also making a statement about themselves. They are artistic. Bold. Powerful. A little different. They see their body as a canvas, but have moved beyond the more fashionable approaches (tattooing, piercing) for something a little more whimsical. But one critical angle was largely missing from the Times article: men. After all, we guys have armpit hair, too. Not to mention belly hair, leg hair, arm hair, back hair and various other patches of the stuff. Some of us even have ear hair. And today’s evolved gentleman is open-minded, politically aware, and stylish. We’ve adopted plenty of style trends once considered feminine and made them our own, from man jewelry and man-bags to moisturizer and binging on cupcakes. Expanding our pit palette may be the next logical step in our social evolution. If getting full sleeve tats is a sign of tough-guy swagger, a touch of fuchsia under the arms is the ultimate badass grooming move—a sign that you genuinely don’t GAF about society’s hidebound definitions of masculinity and are truly your own man. It might also get you featured in the Times.